On some mornings, I stumble out of bed feeling like a complete wreck of a human being—like using the term "hot mess" to describe myself would simply fail to capture the sheer magnitude of all the insecurities and secret vulnerabilities I hide from the world with marginal success on a daily basis. It's nothing unique to me—at least I hope it's not. And it's definitely not all the time. But certain steamy Tuesday mornings in August, I'm just not ready to face all those minute little challenges that life dishes out from all directions: from those work files that just magically disappear from Google Drive, to my uncanny knack of grabbing the shopping cart with the squeaky wheel, to my unfortunate inability to spread butter on a piece of toast without destroying the bread—and a similar ineptitude at splitting bready products like this one right down their middles. In fact, that's really my only complaint about this product: each piece should be just a tad thicker, and they should come pre-sliced. That was Sonia's first comment as well. There's a thin seam along the outside edge of the toasties that indicates that they might be pre-sliced, but upon further inspection, one finds that they most definitely have not been. I have problems cutting bagels down the middle, let alone something this thin. Yes, I know they make bagel slicers, but I don't consume bagels with enough regularity to justify buying one. These "toasties" are even thinner than English muffins. 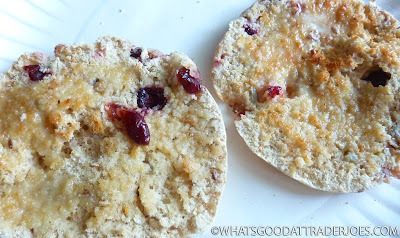 And splitting English muffins has always been one of those life challenges that makes me wish I'd stayed in bed instead of braving the kitchen in search of breakfast. "You've failed as a human being, Nathan Rodgers," that little voice whispers, as bread crumbs and muffin chunks spill across the counter and onto the floor. As far as this product is concerned, we'll just say that the picture of the product in the middle of this post wasn't my first attempt at slicing and buttering these happy sweet bread rounds. Now eating this bread is another experience entirely. After tasting it, I stopped feeling pathetic and frustrated, and began enjoying my day. There's a bright, tart, citrusy flavor, and a nutty whole wheat taste, as well. I'm not a huge fan of orange peel by itself, but it works here since it's subtle and faint, and is mostly overshadowed by the cranberries. The sunflower seeds are a nice touch. It's like they baked a trail mix into a loaf of bread. The consistency of this product is more similar to a regular loaf of wheat bread than it is to either English muffins or bagels, but I guess those keep coming to mind because of the comparable round shape. It's nice and soft, and it toasts well—as long as you can manage to keep each slice in one piece. I liked mine with plain old butter as the only topping. There's plenty of flavor present in the bread, even without any condiments. Sonia experimented with various jellies we had around the house—I don't think she was quite as thrilled with the flavor as I was, but in the end, she'll give the product a thumbs up as well. Four stars from her. Four from me. $2.49 for six toasties. Our favorite crew member told me to try turkey and cheese. When Karen tells me to try something, I do. It was an awesome lunch. I just might have to try that! That sounds great.Do you use any sort of bread-moistener? Normally my turkey sandwiches have mayonnaise, but that doesn't seem right here. I haven’t seen these or those frozen pretzels at my store..! Hopefully they just haven’t arrived yet, these sound delicious. I bet laying this flat to the counter and using a serrated knife would help. These look dense enough to help keep me full, those little dinky sandwich thins certainly don’t. I found them! Definitely not easy to slice in half but i managed and toasted it in a pan, added some drippy almond butter to it. Love the texture of the seeds in there, and thankfully the orange isn’t overwhelming. Best part is my package came with a surprise extra one!! Ha! So it had 7 instead of six!! Obviously a Sign i would love them. Will definitely rebuy. Will definitely be on the lookout for these! There is another company that makes something very similar, and if they are I have a tip for you... You don't have to slice them in half. You can toast them whole and put a little butter on the top if you like. They will also puff up when toasted giving you an opportunity for more dimension for cutting (but they will be hot!). These look quite similar to the Ozery Bakery morning rounds. I wonder if they’re relabeled. I never split them; I just toast them, spread with nut butter, & eat. 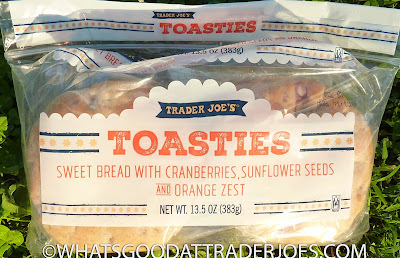 I always keep a package of Thomas' Toast R Cakes in my freezer which is the name brand version of TJ's Toasties. I have never sliced them in half due to the thinness of the product, and I don't think they are meant to be, but to each their own .... no judgment. I don't eat bagels or bread for breakfast but this I eat! I love the texture (soft & crunch at the same time) and its not-too-sweet taste. As for slicing it in half for butter or alike, I don't really care for it and just spread on top after I put the whole thing in a toaster.